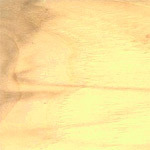 The sapwood of cottonwood is white to faint yellow, while the heartwood is grayish-white to light brown in color. The species has a figured, straight grain and is uniform and somewhat coarse in texture. The wood’s figure becomes more pronounced with staining. Cottonwood is not overly durable in its exposed form with regards to decay. It is not the best choice in such high-risk situations. The wood is reported to have no odor. Cottonwood can be somewhat difficult to dry properly but does so fairly quickly. As a flooring option, cottonwood is somewhat softer of a wood. It is slightly harder than black walnut, roughly eighty percent as hard as red oak, about seventy-five percent as hard as white oak, and about seventy-nine percent as hard as ash. Cottonwood cuts rather easily and cleanly. It glues easily and nails without splitting being reported. This species is generally dificult to sand. Cottonwood’s uses include furniture, veneers, and violins.